“If using fresh broad beans in place of the usual dried haricots strikes you as sacrilege, take comfort from the fact historians believe this was once standard practice in the Languedoc, a region where the duck still reigns supreme. My method here is less traditional – but who wants to turn on the oven unnecessarily in summer?” – Felicity Cloake. Scoop a tablespoon of the fat from the confit duck tin into a large wide casserole (set aside the rest) and put over a medium heat. When hot, add the sausages and confit duck legs and cook for 12-15 minutes or until golden, making sure the sausages are cooked through. Scoop out with a slotted spoon and set aside. Meanwhile, cook the beans in salted water for 1-2 minutes until just tender (how long will depend on their size), then drain and set aside. Add the onions and carrots to the casserole and cook for 8-10 minutes until beginning to soften, then add the tomatoes and cook until they begin to burst. Stir in the garlic and ham, then cook for 2-3 minutes. Strip the meat from the duck legs, slice the sausages and add both to the pot. Add the beans, season and toss together. Heat through gently. Heat another tablespoon of duck fat in a frying pan over a medium heat and fry the breadcrumbs and herbs until the crumbs are crisp and golden (see Make Ahead). Scatter over the casserole and serve. We used thick-sliced Bayonne ham from the deli section of the supermarket. Cool the cassoulet and crumbs separately. Store in airtight containers in the fridge for up to 24 hours. Transfer the cassoulet to an ovenproof dish and warm through in the oven until piping hot. Stir in the broad beans, then scatter over breadcrumbs, return to the oven for 5 minutes, then serve. 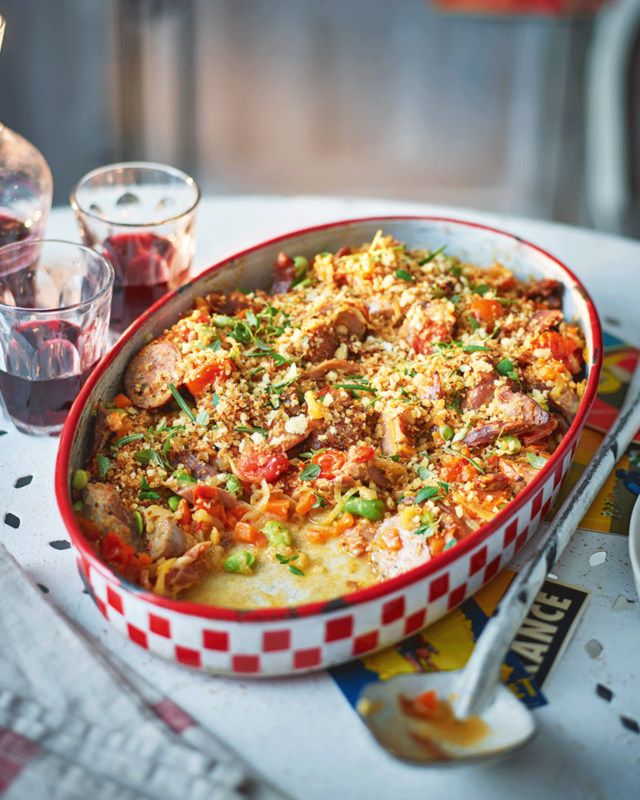 For this cassoulet open a soft, ripe red from southwest France such as a fitou, corbières or pays d’oc syrah.